This very rare bee is only found in a handful of places in the UK with NPT being a stronghold in South Wales. It’s a bit tricky to identify but with a good look you may see the main features: pale blond in colour, with a dark brown band between the wing bases and a ginger tail. The Queens fly very fast creating a high-pitched buzz. The coastal grasslands of NPT are an important area for the species. They favour wildflower habitats such as sand dunes, with plants with long corolla such as Red bartsia. 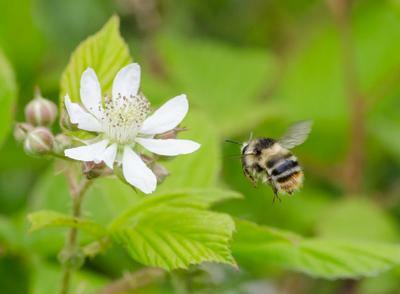 For more information see the Bumblebee Conservation Trust Shrill carder bee page.